Cabo's most luxurious sailing catamaran is now available for private charters! 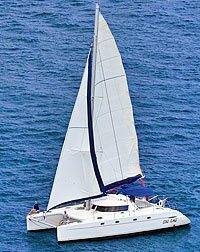 There is no other catamaran in Cabo San Lucas that can match the amenities and style of this French-built Fountaine Pajot sailboat extraordinaire. To keep the feeling of luxury and a personal experience, groups are kept to a maximum of 20 people, not including your crew. While most people prefer to enjoy this lovely lady for day sailing trip, whether for sunset sailing, whale and dolphin watching, snorkeling or a dinner cruise, she can also accommodate smaller groups of 8 or less on overnight charters where you can have dinner and breakfast on board and see more of Cabo's coastline, as well as the comfort of her four air-conditioned staterooms and 2 bathrooms in a small group setting. A full English-speaking crew is at your beck and call. Below are some suggested itineraries (jump to prices), but we can customize to your needs and interests. Just ask us for a custom quote and we'll be happy to prepare one for you. Sip on your favorite drinks as you enjoy the most incredible sunsets over the pacific ocean. See where the desert and ocean unite creating the most dramatic landscapes as background for your trip. Take incredible photos of Lands End and The Arch at Sunset and enjoy fresh ceviche and guacamole made freshly on board. You can even take a quick snorkeling stop at Pelican Rock if you wish. True Heaven! Daily at 4:30 PM. Time may vary depending on the season but will be shown on your confirmation. Sail to Land's End for some great photos of the Arch and Lovers Beach, then jump into the warm waters of the Sea of Cortez and start an underwater adventure! Enjoy snorkeling with tropical fish and other marine life at Santa Maria Bay, Chileno Bay or Pelican Rock. Relax on deck, in the air-conditioned living areas or just sunbathe and let some good music set the mood with good friends and ice cold drinks, soaking up the warm Cabo San Lucas sunshine. Choose the afternoon trip and you can even see the sun melt into the Pacific Ocean at sunset over Land's End. True Paradise! Twice Daily at 9:30 AM & 3:30 PM. Exact start time may vary with the season but will be specified on your confirmation. Similar to our snorkeling tour but instead of snorkeling for an additional hour, we'll spend our time cruising, sailing sightseeing, and watching for whales (Dec-Mar) as they arrive to the Sea of Cortez to calve. If you're lucky, you'll be able to get up close to the whales for great photo opportunities. On this trip you can also see dolphins, sea turtles, or manta rays, or just take a sailing trip and enjoy your music, relax with a cool one and make everyone on the beach jealous! First 8 People Same Price. Extra Cost Per Person over 8 Px. Kids Under 5 Years $80.00 FREE! Note: Special Requests such as Shrimp Platters, Special Wines or Private Chef Services are Available. Request quotes when booking. Overnight trips are also available upon request and quote for up to 8 people.